It was early evening on the outskirts of Casablanca when I shouted this, while white knuckling the wheel of the Hyundai i10 that we had rented for the second half of our trip around Morocco. It was already dark at that point, and the weather had been on and off rain for our drive from Chefchaouen which in turn, along with a lack of washer fluid, had meant that our windshield had become smeared practically beyond visibility. It was also at that point that along the busy road leading into Casablanca that dozens of pedestrians decided that walking out in front of traffic with little warning was a better alternative to walking another twenty feet to utilize the footbridges that the government had built to no doubt save money on the cleanup costs of what I could only assume were daily pedestrian deaths. It was in this moment that I said to myself “I wish I had done some more research before we did this.” and thus, this blog post was born. First things first, you need to pick up your rental car. After experience in both Marrakesh and Fez, there are several suggestions we would offer. The first is that when you go to book, try to avoid the 3rd party booking sites and instead book directly through the rental company. We had an issue with getting a car in Fez because the booking site we made the booking through did not send us a confirmation and after contacting the supplier we were supposed to pick up the car from, were informed that they did not have any cars available. Luckily, we were able to book through another company, but the next morning the 3rd party site emailed us saying they had found another rental available with a different supplier and to go to them to pick up the car. Ultimately, we got our money back on the original rental but not until spending some time and stress on the phone sorting it out, which could have been avoided had we simply booked directly. Second, is to pay close attention to the condition of the car when you pick it up and to make sure to take photos or a video of any damage present. The first company we rented with was very good about noting the scratches and dings that the car had when we picked it up, using a tablet to both note the position and take a picture of said damage. The second company, used only a paper diagram, which was more or less covered with x’s all around. When we returned the car in Casablanca, the attendant asked us about the front bumper, which was starting to detach due to a broken piece of plastic. Luckily, we had gone all around the car and snapped photos before departing Fez, which likely saved us a huge amount of money, since the form they provided us with probably wouldn’t have been adequate to prove it wasn’t like that when we picked it up. Third, is to consider taking the supplementary coverage for damage. Most of the time we would decline such coverage and take our chances, and we did get all of our rental deposit back even without it. As was just mentioned though, the cars are often times already marred pretty well from the previous driver’s learning experience and you can protect yourself with the insurance to be sure you will not owe anything at the end of the rental. Of course, you should review each policy carefully to determine exactly what is covered and what isn’t but with the incidental holds that the companies will put on your credit card often times being more than $1000 USD (Roughly 800€) it will sometimes also bring down the amount that the rental company will want to hold onto, as well as protect you in the event anything happens to the vehicle. The next bit of advice is exactly what you are doing right now, that being to educate yourself! 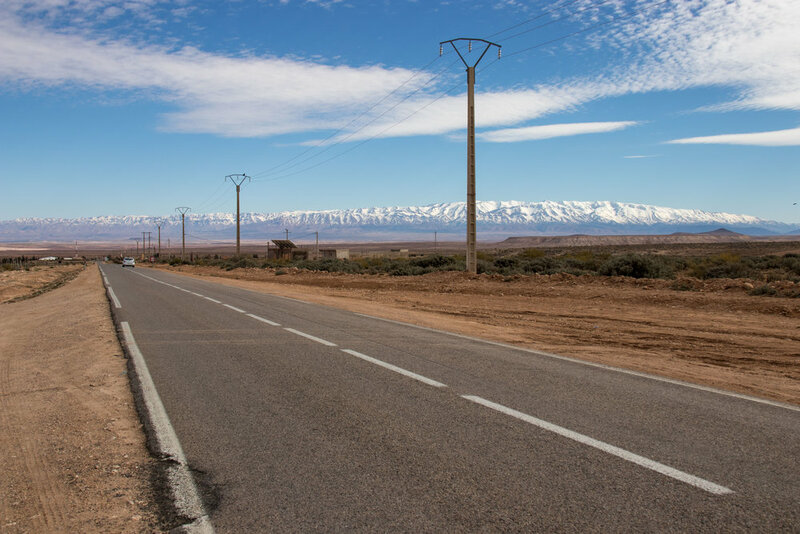 I can say that most of the frustration we had when driving around Morocco was primarily due to us not knowing how their road classification system worked. This is one of the most important aspects to familiarize yourself with before making the decision to drive. There were several occasions that added hours onto the journey because we picked a route with a less than optimal road configuration. A Roads (Always good) – National motorways of the country and could be compared to highways in the U.S. or Europe. They are well signposted and marked, with fuel, and other services abundant. They are mostly found in the North; connecting the major urban areas and will include tolls at various points. N Roads (No worries, usually) – National secondary roads that run through most of the country that aren’t covered by the motorways. Most of the time they are well signposted and marked, with fuel available, but at less frequent intervals than on the motorway. R Roads (Repaved Rarely) – Secondary roads running between the N numbered roads. Most of the time we found them in varying states of repair, with most being partially washed out in the mountains and often times no lines painted on them. Signage was also usually poor. Expect no fuel or services and many games of chicken with oncoming drivers. P Roads (Plan not to get your rental deposit back) - Worst of the worst. Most of the time you struggle to differentiate between a donkey path and a road. Sometimes paved, other times just dirt. Potholes, ruts, and washouts are common. If you are in a compact car it is best to avoid these where you can, due to the potential damage that can happen from bottoming out in a pothole and ending up falling through to the other side of the planet. Now that you are familiar with the roads, the next thing to tackle is a navigation app. During our time there, Google maps was refusing to give us driving directions (maybe someone can fill us in on why). As a result, we first relied on Apple maps for our directions which lead us to accidentally take the “scenic route” through the High Atlas Mountains… in a Fiat 500. Needless to say, that was less than ideal. The little Fiat that could! On the second half of the trip we decided to do some research, poked around and found Here WeGo and Sygic. These two allow you to download the road maps for the entire country for offline use (which is super helpful if you are relying on wifi). We had good success with them, with the only small problem being that they had trouble finding a lot of destinations without the exact address inputted. Out of the two though, we would recommend Here WeGo as it also includes city maps that were super helpful for not getting lost in the medinas. The phone equipped GPS was more than adequate while driving but it did have trouble in the cities, so it would definitely benefit from a supplementary GPS receiver if you are going to use it for foot-based navigation. Despite the fact that much of the driving in Morocco would bring to mind commuting on Fury Road, there are actually a loose set of rules for interacting with your fellow drivers. The following is what we picked up while behind the wheel. You will be dealing with the intricacies of passing often in Morocco. If you are obeying the speed limit (which as a foreign driver we would highly recommend) then you will be passed by most everyone else besides the large truck drivers. The process often times goes something like this: you are blissfully driving along avoiding potholes when you notice in your rear-view mirror that a driver is coming up behind you. The passing driver proceeds to get close enough to your bumper that they could practically give you a colonoscopy, and then when they get a stretch of road that looks like they can pass you (which may or may not be in a passing zone, since traffic laws are often treated more like casual suggestions), they will swing out and either honk their horn, flash their lights, or both to indicate they are passing you. Occasionally you will also notice the vehicle in front of you flash their turn indicator seemingly at random. What they are doing is actually signaling whether or not it is clear for you to attempt to pass them. A left indicator tells you the opposite lane is not clear to pass. A right indicator tells you the opposite lane is clear to attempt to pass. Of course, it is always a good idea to inch out to visually check before you commit to passing, as the driver in front of you may not have the best judgement. The use of a car horn for many Moroccans is akin to breathing air: it is so instinctual that it barely requires a thought. If you aren’t familiar with driving in a place that can be as aggressive as Morocco, it can definitely be overwhelming at first. The best course of action is to simply try and ignore it or, if you are like those of us in Boston, go ahead and embrace the culture by giving it right back. Parking in Morocco is like most other aspects of driving there...confusing. No parking zones are indicated in the city by a candy cane red and white striping on the curbs. Most areas of the major cities will have pay stations to buy tickets while you are parked. There are also many times attendants in yellow reflective vests who will offer to watch your car. We only experienced this in Rabat, and while it seemed legit enough, we were curious as to whether they were actually government sanctioned and would keep us from getting a parking ticket or not. Ultimately, when we came back several hours later, there was no ticket and everything seemed fine. If you are staying in the medinas during your trip, you will also have to find overnight parking as the streets are too narrow even for the smallest of compacts to fit through. We didn't have to worry about this as all our accommodations had on site parking after Fez. Our advice though for the first place to inquire would be with your riad. The proprietors often times know of reputable lots or have arrangements with local ones that can get you a better price than the strangers who will undoubtedly approach you on the street. It is best to contact them ahead of time so they can arrange it and direct you. After that, the forums on Trip Advisor and Lonely Planet are a good place to check for recommendations. As with everything, use your best judgement and always make sure to take any valuables with you (including the registration/insurance paperwork). The majority of gas stations are full service, with attendants who will do the fueling for you. The one hiccup we had when we first stopped was that we didn't know what type of fuel the car took. The two options are autoplomb and gasoil. The best thing to do is ask the rental car agents when picking up the car to ensure you are always getting the right type, although we never fully figured it out and the attendants seemed to always know what our vehicle took. Most stations outside the major cities aren't able to take credit cards so it is a good idea to always have enough dirhams on hand between stops at an ATM. It is also customary to tip the attendants five to ten dirhams when they're done. Whether it is a cart being pulled by a donkey or horse, a herd of goats running along the road, a line of camels crossing in the desert, or the many stray dogs and cats that tend to dart out into the road from time to time you are assured to come into contact with some form of wildlife or another while traversing the country. As with all other aspects of driving, they are best handled by slowing down, staying alert, and always assuming that the most nonsensical thing that can happen, will. Typical traffic jam in the rural areas of Morocco! The pedestrians in Morocco are one of the ever-present hazards that pop out pretty much wherever you are driving in the country, whether on a mountain road or in a major city. Most of the time it will be people simply walking off the sidewalk, forcing you to slam on your brakes and curse them out (especially if you are driving a car with a manual transmission). In the more rural areas kids will often times either run alongside the car or walk into the road in an attempt to get you to stop. We had several people walk out into the road directly in front of the car while attempting to stop us on the way to Merzouga, more than likely to try and get us to come into their roadside shop. Hitchhikers and people walking in the road are also common sights. Like with the wildlife, vigilance and defensive driving, along with a lot of patience are the best ways to deal with this. In general, driving at night is a bad idea. With the multitude of hazards that are abundant in Morocco, darkness only compounds them even further. We visited in March, so sunset was sometime between six and six thirty which meant we were occasionally driving after the sun had gone down. Of course, it will depend on the road conditions where you are going, but on our drive from Marrakesh to Merzouga, we ended up getting to Ouarzazate much later than anticipated and after trying to continue on, we made the decision to head back to Ouarzazate and spend the night there rather than taking the risk. It was aggravating and unanticipated but was probably the smartest decision we made on the trip, due to how risky it would have been to push on to our destination. The best decision if you find yourself driving after the sun has retreated and are still hours from your destination, is to stop and find a place to rest until you can carry on the next day. Overall, driving in Morocco was an enjoyable experience and a great way to get off the beaten path while exploring at your own pace. That being said, if you don't prepare it can also be an unbelievably frustrating one as well. Hopefully our advice here will aid anyone thinking of going with the self driving option on a trip to the country and will lessen the aggravation. Happy motoring!